India's aim to achieve the target of Make in India program will be enhance as Alstom has been awarded new contract to supply 31 trainset and 8 coaches to Mumbai Metro line-3 which will be manufactured under Make in India Program. Mumbai: Once again Alstom India awarded Rolling Stock contract to supply manufactured 31 trains of 8 coaches to Mumbai Metro Rail Corporation (MMRC) for Mumbai Metro line-3. All the coaches need to be manufactured under Make in India program. These trains are highly energy efficient with regenerative braking, with having 75%motorization & LED lights. Mumbai Metro-3 trains will operate on 25 KV AC traction & will carry 2350 passengers each. Some additional features of Mumbai Metro3 line viz. equipped with driverless technology, smart temperature & display control and some safety features like CCTVs & help points to provide efficient. The contract for supply of new metro coaches (31 train sets) awarded to a consortium of Alstom Transport India Ltd and Alstom Transport S.A. France. All trains will be manufactured from India under “Make in India” programme of the Govt. of India. Work consists of “Design, Manufacture, Supply, Installation, Testing and Commissioning of 31 Train sets with 8 cars configuration. The train will have length of approx. 180 m, with approx. 2350 passenger carrying capacity (estimated at 6 passengers per sq. metre) and approx. 300 passenger carrying capacity for each coach with having longitudinal seating arrangement. Car body material will be of stainless steel. Every car will have 4 doors on each side. Trains will operate on 25 kV AC power supply. The trains will have design life of 35 years. Consortium of CRRC Nanjing Puzhen Co.Ltd., CRRC International Corporation Ltd and CRRC Changchun Railway Vehicles Co. Ltd.
Consortium of Alstom Transport India Limited and Alstom Transport S.A.
Consortium of Kawasaki Heavy Industries Ltd. & BHEL. Mumbai Metro line -3 of Mumbai Metro is also known as Colaba-Bandra-SEEPZ line.This Metro Line will connect from Cuffe Parade business district to Seepz in north-central with total 27 station including 26 underground and one at-grade station.The total cost of this corridor is estimated at ₹23,136 crore (US$3.4 billion). This line will very helpful in traffic decongestant on the Western Line between Bandra and Churchgate. The 1.2 km section of the line between Bandra Kurla Complex and Dharavi stations will pass through the under of Mithi river. The very unique features of this Metro Line are that it will be the 2nd underwater metro rail tunnel in India after the tunnel below the Hooghly river on Kolkat Metro Line 2. Alstom provides a complete range of systems, equipment and services in the railway sector. Alstom India mainly work for Rolling stock & Components, Systems & Infrastructure, Transport Information Solutions and Train Life Services. 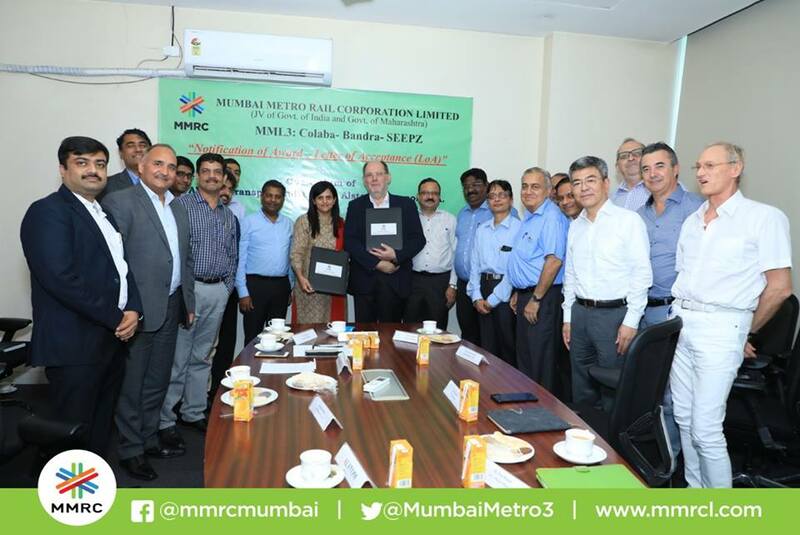 This contract of Mumbai Metro line-3 will be fourth rolling stock project for Alstom India. Before this Alstom India has also worked for Kochi Metro, Lucknow Metro and Chennai Metro under Make in India program. On January 2, 2016, Alstom has delivered the first Metropolis train set to Kochi Metro Rail (KMRL) of the 25 train sets which was ordered by Delhi Metro Rail Corporation (DMRC) in August 2014. Alstom was also awarded contract for Lucknow Metro Rail Corporation (LMRC) to provide 20 metro train sets, which will be each of four cars. The Metropolis trains set for Lucknow has 186 seats which arranged longitudinally, and includes two dedicated zones for passengers with reduced mobility. Previous articleHow far women are safe in public transportation in India?